Reach major decision-makers in your target market with our ready-made Canadian attorney email database. You'll get instant access to names, phone numbers, email addresses, and more. Buy this targeted Canadian lawyer mailing list, approach sales leads, and close deals with Canadian barristers and other legal professionals. Canada's attorneys, also referred to as lawyers, act as advisers and advocates for their clients. Our Canadian attorney email list allows you to directly contact these legal experts with the primary objective to develop stronger business connections and secure sales leads. Our ready-made Canadian lawyer email database provides you with the verified contact information you need to begin calling, mailing, or emailing right away. This mailing list of lawyers in Canada is full of potential sales leads waiting for solutions from your products or services. When you buy and download this extensive business database, you'll have the ability to master direct marketing and leverage targeted email leads. 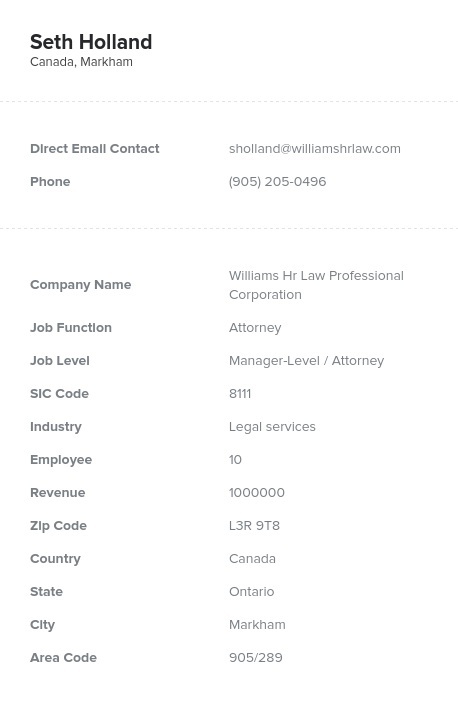 This business email list is also effective for building strong B2B relationships with some of the top Canadian attorneys. Attorneys in Canada have the legal knowledge, skill, judgment, and education needed to make a difference in the lives of their clients and the community as a whole. This human-verified email marketing list is comprised of attorneys, lawyers, barristers, and other legal professionals who have the power to positively affect your business. Get this pre-built Canadian attorney email database, or build your own targeted email list with our list-builder tool!